Esophagus - Angiectasis in a female F344/N rat from a chronic study. 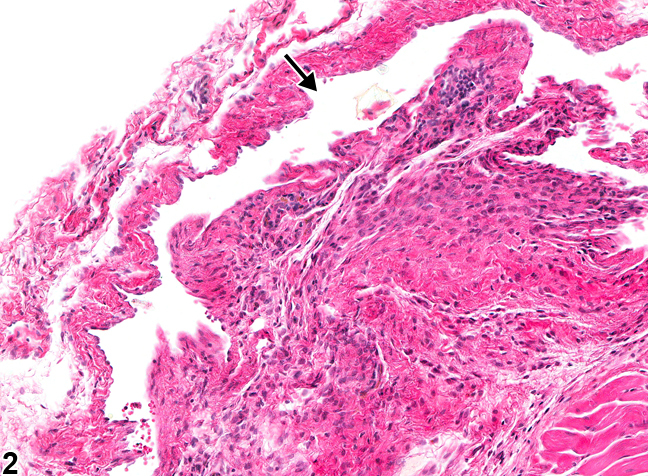 Dilated vascular spaces (arrow) are visible in the wall of the esophagus (asterisk). 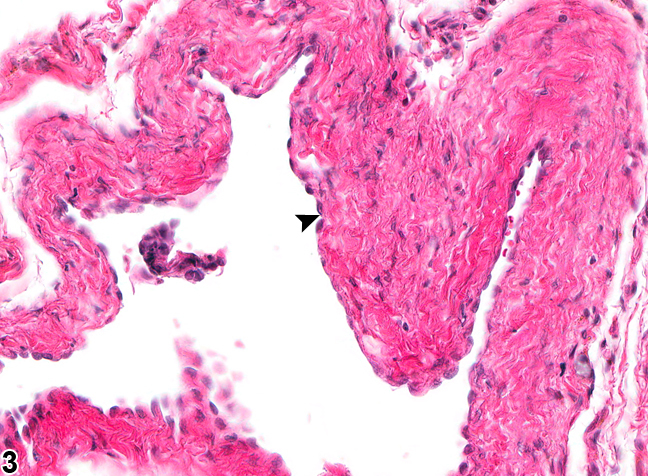 Esophagus - Angiectasis in a female F344/N rat from a chronic study (higher magnification of Figure 1). Dilated vascular spaces (arrow) are visible in the wall of the esophagus. 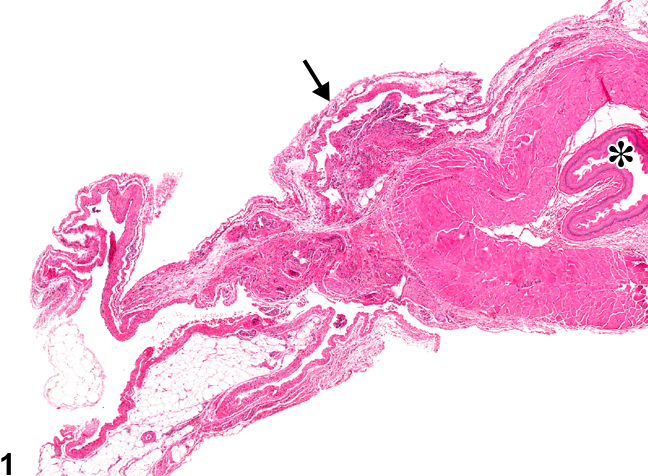 Esophagus - Angiectasis in a female F344/N rat from a chronic study (higher magnification of Figure 1). The dilated vascular spaces are lined by unremarkable endothelial cells (arrowhead). Angiectasis (vascular ectasia) is primarily a spontaneous, age-related lesion that can also be a response to chemical injury. Angiectasis consists of widely dilated vascular spaces, especially capillaries (or sinusoids) and venules, that are lined by unremarkable endothelial cells. The number of vessels is not altered, and there are no changes in the stroma of the organ. A distinction betweenangiectasis and hemangioma should be attempted, although the difference between angiectasis and hemangioma is sometimes not obvious. Hemangiomas tend to be well-circumscribed unencapsulated masses composed of tightly packed dilated vascular spaces. Each vascular space is enclosed and lined by a single layer of normal-appearing endothelial cells aligned on collagenous septa, which are usually thin, although some have broad collagenous stromata. Angiectasis does not usually present as a well-circumscribed mass, as the dilated vascular channels are often irregularly coursing through connective tissue. Angiectasis should be diagnosed and given a severity grade based on the extent of the lesion. Boorman GA, Everitt JI. 2006. Neoplastic diseases In: The Laboratory Rat, 2nd ed (Suckow MA, Weisbroth SH, Franklin CL, eds). Elsevier Academic Press, Burlington, MA, 479-511. Gad S. 2007. The mouse. In: Animal Models of Toxicology, 2nd ed (Gad S, ed). CRC Press, Boca Raton, Fl, 19-146. Gross TL, Ihrke PJ, Walder EJ, Affolter VK. 2005. Vascular tumors. In: Veterinary Dermatopathology, 2nd ed. Blackwell, Oxford, UK, 735-758. Mitsumori K. 1990. Blood and lymphatic vessels. In: Pathology of the Fischer Rat (Boorman GA, Montgomery CA, MacKenzie WF, eds). Academic Press, San Diego, CA, 473-484.